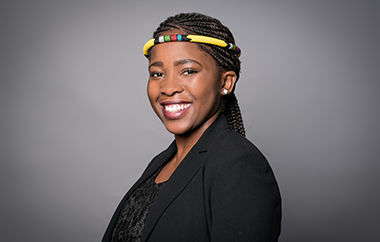 Pheladi Venda Tlhatlha is focusing on understanding the perception of energy in disadvantaged communities and also the reduction of energy poverty. She believes clean energy should be accessible to and affordable for impoverished communities. In South Africa, where Pheladi grew up, access to energy is challenging and limited for low-income households. She is exploring renewable energy technologies and implementable strategies to overcome these barriers of available energy options. Energy security demands energy efficiency and reduced expenditure, especially for low-income households. Her approach is to take economic, social and environmental factors into consideration, such as the unemployment rate and power outages in the country. An investigation of the energy sector and the adaption of renewable energy technologies can lead to a positive impact on human well-being, poverty reduction and economic growth. Pheladi’s interdisciplinary research targets geographical and social issues and seeks technological advancement for informal settlements, as well as sustainable alternatives. Her research project can be divided into two levels of energy services. The first level is directly offering physical access to electricity, while the second level is indirect and targeting access to equipment, such as heaters, stoves and lamps, which should be affordable for and accessible to the end-user. Pheladi aims to work locally to create an impact on the national level. During her work for Greenpeace Africa, Pheladi focused on trends and policies in renewable energy and climate change. Her personal interest particularly lies in including women in the energy and development sector. 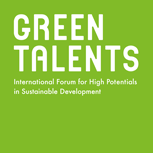 During the Green Talents Science Forum she hopes to gain further insights into innovative sustainability fields, as she focuses on reaching developing countries and creating solutions which will have a positive impact on low-income communities in Africa. Her research stay in Germany is important for her professional growth in order to develop her goal of creating affordable renewable energy. The jury acknowledged the relevance of Pheladi´s research to Germany. One of the key factors of sustainable development is collaboration and innovation. Although access to energy in Germany is rather different to the situation in South Africa, the exchange of research and knowledge will be of benefit to energy conservation efforts in both countries.